Feel free to comment and contribute. Welcome to Meadowlay which also is the home for our latest pilot project, Eggs from Scratch. Battery cages may be gone from Europe but millions of hens, most of them in fact, are still kept in conditions far remote from the natural life they are really good at, scratching around for their food in a varied and stimulating environment. Care for the land, hens reduce pests. They are the ‘Dyson’ of the farming world. add manure in a balanced way. Tasty eggs related to the supplementary diet the hens find, foraged nutrients usually result in a varied, and usually higher quality, healthier egg. Cages do still exist, now called ‘Enhanced’ which is an excuse to constrict their ability to roam anywhere to maximise production, increase stocking density and fully control their environment. Barn eggs come from a big shed without cages. Free Range are mostly the same with holes cut in the side of the house and a certain amount of land for the hens to roam, if they want to. free to forage for some part of their diet. This system is best called ‘Pasture’ hens. It is not new. Tradition, and nature, indicates it is the best way. 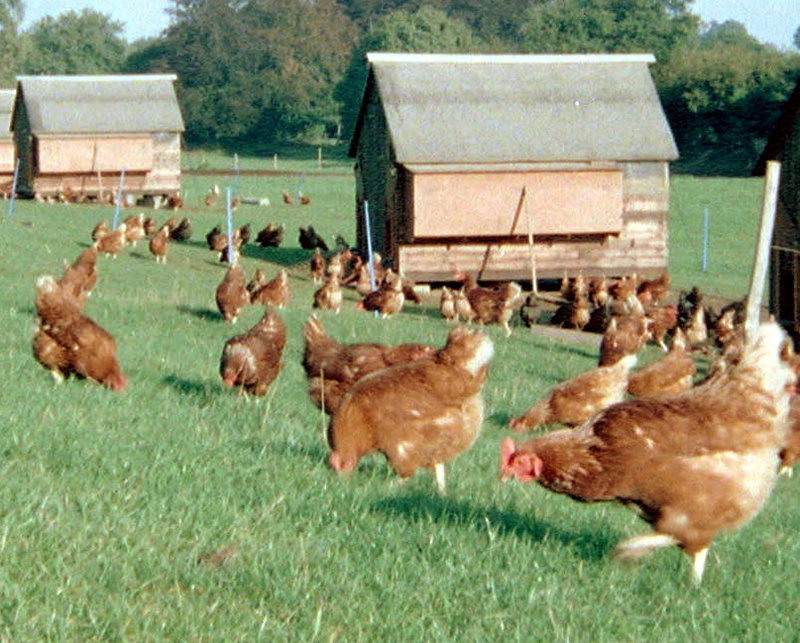 Pastured chicken eggs, meaning from actual free roaming, bug/worm/compost/grass/dirt pecking hens and chickens have five times the nutrient value of commercial organic eggs. Below are the latest findings from MotherEarth News. In 1974, the British Journal of Nutrition found that pastured eggs had 50% more folic acid and 70% more vitamin B12 than eggs from factory farm hens. If one allows "free range" to include "herding", free range was a typical husbandry method at least until the development of barbed wire and chicken wire. The generally poor understanding of nutrition and diseases before the Twentieth Century made it difficult to raise many livestock species without giving them access to a varied diet, and the labour of keeping livestock in confinement and carrying all their feed to them was prohibitive. In the case of poultry, free range was the dominant system until the discovery of vitamins A and D in the 1920s allowed confinement to be practiced successfully on a commercial scale. Before that, green feed and sunshine (for the vitamin D) were necessary to provide the necessary vitamin content. Some large commercial breeding flocks were reared on pasture into the 1950s. Nutritional science resulted in the increased use of confinement for other livestock species in much the same way. This was the ‘battery’ system. Rows of cages stacked in columns within giant houses providing totally ‘control environment’. Awareness of the poor welfare led to consumer pressure when some alternatives started to be provided in volume in the late 70’s. This directly gives us the combined market we see today of Battery intensive and free range alternatives. The future will be a continuation with the immanent 2012 ban on cages as we know them with the changeover to ‘enhanced’ cage systems – a larger cage with certain welfare improvements such as lower density and a scratch area provided. Less eggs will be produced in this manner, though caged birds will still exist. Free Range systems have progressed from the small houses scattered throughout a field and are now large, semi controlled environment houses strategically positioned to give access to whatever land is available to fulfil the requirements. They are getting more intensive, certainly on the use of land resources! As an idea of what this really means, using available literature, estimates of the proportion of birds ranging at any one time vary greatly, typically less than 10% but sometimes in excess of 50%. Even when many birds are outside, most generally stay close to available housing unless there is extensive external cover or feeding provided. Biodynamic farming is widely acknowledged to be one of the most sustainable forms of farming in existence. Fundamental to it is the recognition that all life is interconnected and that every piece of land, however small, can be considered a microcosm of a greater whole. As for our ancestors for whom agriculture was equated with culture, the biodynamic grower or farmer seeks to work creatively within this context. At the heart of the biodynamic farm lies the farm animals. Their manure, in conjunction with well rotted farm compost, is used to help intensify soil and plant health and vitality. More significantly, when mixed together they form the basis of the unique biodynamic ‘preparations’ - essentially homeopathic tonics which are sprayed on to the land and plants in minute quantities. Biodynamic farmers pay attention to what is known as the ‘planting calendar’. An awareness of the influences coming from the moon and planets is considered useful when appraising farming operations ie when to sow and plant or harvest. Again this was an approach practiced by our ancestors. Biodynamic farming is a method of farming developed in the 1920s that is simply organic farming taken to its highest level. Farmers view the entire farm as a living organism, avoiding outside inputs as much as possible. Biodynamics also incorporates a form of spiritualism into its practice and uses preparations in a similar way to homeopathic medicine, which was also founded in the 1920s by the German philosopher Rudolph Steiner. Eggs from Scratch is a pilot project for urban communities. Working with Growing Greenwich we intend to produce the same high quality, high welfare produce from brown belt land identified as suitable and secure. The aim is to provide a local method of balanced production in conjunction with residents of the London Borough of Greenwich and supply local markets via the established network of Food Co-operatives and their initiatives.